Follow the Walkers family on a tour of the city of Rome! 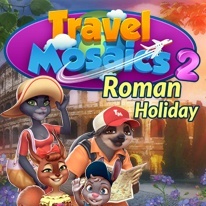 Travel Mosaics - Roman Holiday is an incredibly fascinating, colorful and edutainment game for people of all ages. You will follow the Walkers family in the tour to see the most famous and significant tourist attractions of Rome while learning a lot of new skills, answering tricky questions as well as collecting gold coins and souvenirs. - 2 difficulty modes to choose from for a relaxed game or a real challenge! - Tricky trivial questions about Rome.